Over the last four months we have written articles about how Veterans Treatment Courts (VTCs) can incorporate children’s services into their courts. We discuss how to collaborate at the local level, how to evaluate VTCs to include veterans and their families, a policy perspective on why services for children and families are usually excluded from VTC legislation, and how to serve these “invisible children” in the VTC. We reviewed the case for serving veterans and their family members through community-based agencies. These agencies can go well beyond what the VA is able to do to provide services and support to the 40 percent of discharged veterans with children. The VA focuses on veterans, but state, local, and community agencies can and should help their families. Although there is overall agreement on the need to serve children of veterans once their numbers are taken into account, most courts are not aware of the ways to access funds to provide services. First, the court will need to build a network of services and decide how to refer and follow up with children’s service agencies beyond the usual partners of the courts. The court needs an inventory of children’s services in the area. Ways to find these agencies can be asking your local Veterans Justice Outreach staff from the VA, asking your local coordinating bodies, talking with local congregations or discussing the service agencies that the nearest Family Drug Court may be working with in their activities. The Court will need to ensure the availability of evidence-based, family-centered treatment services and understand which agencies may have just received new federal or state funding and if they actually are counting veterans’ children in their caseloads. Sometimes we work with agencies that want to get funding for higher-quality, evidence-based programs. Their usual move is to seek federal funding from the dozens of discretionary programs that still exist in federal agencies. 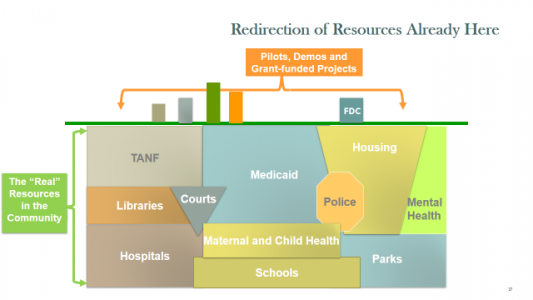 When we ask if state or local funding could be used instead, they typically say that resources are too tight to fund new programs. We will only make this important change if we can get external funding — we could never use our own funds or redirect current funding for that purpose; we’ll change our practices, but only if someone else pays for it. We don’t really care if this new approach works better and has shown that it produces better results than our current programs; better outcomes for our clients don’t have anything to do with how resources are allocated in this agency. Everything we are now funding with resources we control is more important than this new idea that we want to try out — with somebody else’s money. So the conclusion? Veterans treatment courts need to take children and family members into account when they operate. And they need to count the resources they need, as well as those they already have, to decide how to fund the programs those children and families need and deserve.